As a sliding puzzle fan, every new design that uses an original idea is always welcome, even it it has already been done, which is the case of Siebenstein-Spiele's Confusion, designed by Jürgen Reiche (the company's founder). A very challenging puzzle that will surely frustrate even the most patient fans. The concept featured in this puzzle was firstly used, to my knowledge, by Hanayama with their Puzzle Impossible. Siebenstein-Spiele has also made a similar version before, which I have played and really liked called Digits - both identical in difficulty. 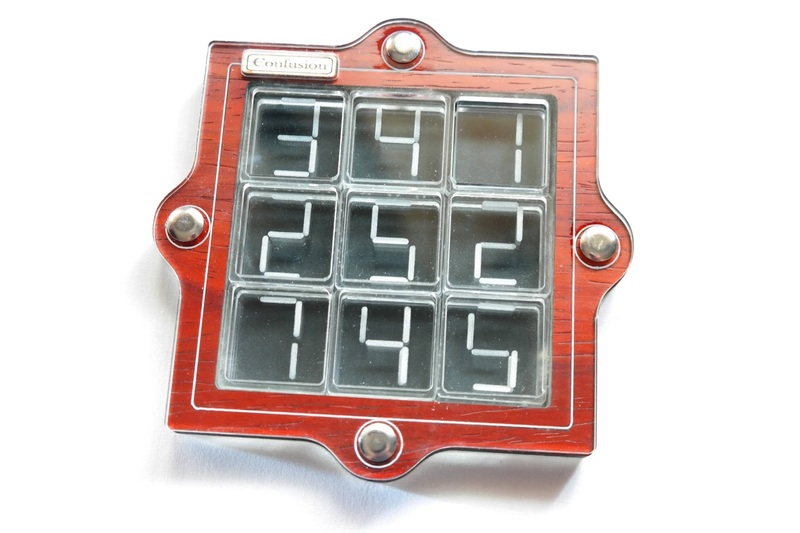 The puzzle is very well made from a combination of acrylic pieces and a wooden frame. It measures 13.4cm in diameter, which is nice to handle in your hands. The pieces can't be removed from the puzzle, so the only way to solve it is by sliding the pieces (or to dismantle the puzzle, but that would be cheating...). The difficulty level is a 6/7 by the manufacturer or a 9/10 by an alternative scale. 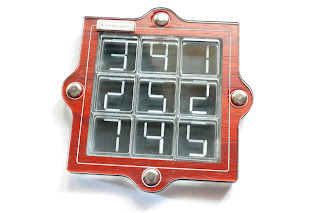 The idea behind the puzzle is brilliant and consists of using numbers like the ones you see in digital clocks and wristwatches and then changing the way they look by moving some of their segments. You do this by sliding the pieces, in two layers. The combination of the segments in both layers, when correctly displayed, will show a number, but as soon as you move one or more pieces from their space you'll see strange and odd characters, as if your watch is out of whack. The goal is to mix the pieces and then rearrange the numbers in the correct order from 1 to 9. The bottom layer of the puzzle has nine pieces, but the top has only eight. This empty space will be how you move the pieces around the frame. You can even use a piece from the top layer in the bottom and vice versa. The number of possible combinations is staggering and because of this the puzzle is extremely difficult. You need to study the appearance of each digit and know really well which segments compose each number to understand how you can move your pieces and not become frustrated by so much confusion - hence the name of the puzzle. Confusion by Siebenstein-Spiele is a great puzzle and one that shouldn't be missed if you like very difficult puzzles. Its design is also very attractive and will look beautiful on any shelf or coffee-table. I wouldn't recommend this one for beginners. Availability: You can find a copy of the Confusion puzzle at Brilliant Puzzles for $30.95 USD. There are also many other puzzles by Siebenstein-Spiele.